Eyes are a prominent facial feature. It is the surrounding skin, rather than the eyes themselves, that conveys emotion. 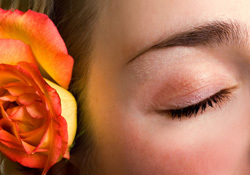 The tissue, muscle, fat, hair and lashes all contribute to the wide array of expressions. Age, sun exposure and hereditary factors all contribute to wrinkles, deep lines and puffiness around the eyes. The aging process can cause unwanted changes in expression, causing us to look permanently fatigued and older than we really are. These changes in appearance can cause emotional distress and sometimes even visual impairment. An eyelid lift, or blepharoplasty, is designed to restore a more youthful appearance to your eyes. It may involve the upper lids, the lower lids, or both. Traditional Blepharoplasty: An incision is made in the crease of the upper lid toward the temples. Once healed, it is not noticeable when the eye is open. On the lower lid, the incision is made along the lash line toward the temples, and is hidden by lashes when healed. The Transconjunctival Approach: This is a newer technique for lid blepharoplasty, involving an incision inside the lower lid. Fat can be removed through this incision, but excess skin cannot be eliminated. Laser resurfacing of the eyelids is a non-surgical alternative that may delay the need for a surgical blepharoplasty. It results in significant tightening of the skin around the eyes, but will not affect the fat around the eyes and may even accentuate it. Please ask your doctor if you have any questions about which procedure is right for you. Local anesthesia is given around the eyes. An intravenous line is started so that sedation may also be given. During the procedure you will be awake but comfortable and relaxed. General anesthesia is rarely used. This procedure is performed on an outpatient basis at our surgical center. It is important to arrange for care after the surgery. Someone must drive you home and be available to care for you for the first 24 hours. Complications are unlikely when performed by a surgeon with experience in blepharoplasty. These include: bleeding and swelling, delayed wound healing, infection, drooping of eye upper or lower eyelid, asymmetry, double vision and dry eyes. The area surrounding the eyes will remain swollen in the days following the surgery. It should begin to subside after the first day. Some vision blurring is normal. The stitches will be removed in 4-5 days. Swelling and bruising will persist for about 10 days, but you can begin wearing makeup to help conceal these concerns. You may expect to resume normal activity within a week to 10 days, and start enjoying your new look within approximately 10-14 days. It may take about 6 months for the scars to lose their redness. Wrinkling will recur later in life; however it is unlikely that the “bags” will recur because the fat has been removed. Deeper wrinkles around the outer eye extended onto the temple are not greatly affected by the eyelid lift. These areas may be treated with laser resurfacing. For more information about Eyelid Surgery or to schedule a consultation with Dr. Sharma, call our office today. We look forward to meeting you! Jupiter ENT Specialist, Dr. Vijay Sharma, is a specialist in sinus health and provides personalized care to his patients, including Balloon Sinuplasty. Dr. Sharma treats all sinus problems with the very latest in medical technology and the newest FDA approved products.